The critically-acclaimed Assassin’s Creed franchise returns to PlayStation 4 with new stories and quests, an exciting new world to explore and a completely redesigned combat system. Explore the sand-swept kingdoms of ancient Egypt as the Assassin’s Creed story winds back the clock thousands of years to the very birth of the Assassin’s Brotherhood. 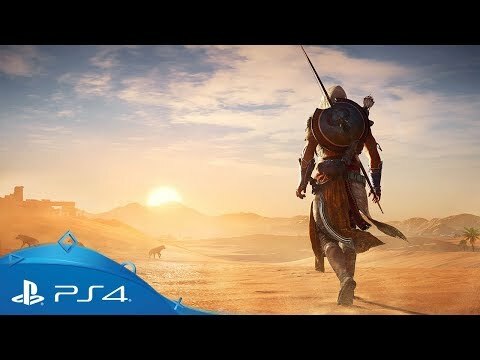 Take on the role of master swordsman and trained killer Bayek in an open-world adventure filled with deep memorable quests and forgotten myths. Challenge yourself and your foes with a refined, loot-driven system of progression that allows you collect new weapons and develop Bayek’s lethal skills in line with your own particular playstyle. From the lush agriculture of the Nile Delta to the searing isolation of the Siwa Oasis or the incredible pyramids of Giza and Memphis – the iconic world of ancient Egypt is yours to explore as you choose. The complete single player adventure, featuring wide open environments, gripping stories and deep progression. Includes the complete Standard Edition, plus the 'Ambush at Sea' mission, the 'Desert Cobra Pack' and three ability points. Includes all Deluxe Edition content, along with the Season Pass, providing access to all major forthcoming expansions. Relive the incredible saga of series' icon Ezio - three complete games, all remastered for PS4. Explore Paris, skulk through London and sail the Caribbean in three of the generation's biggest action adventures. Visit India, Russia and China in a series of side-scrolling, standalone action platform games. Looking for a heart-stopping adventure? Enter an epic world of danger in the first standalone adventure in the Uncharted world, exclusive to PS4. Break the cycle of violence with a stunning retelling of the classic series, exclusively on PS4. Join Nathan Drake on a perilous hunt for untold riches in his debut PlayStation 4 adventure.